Abstract: Linnaeus' first dissertation, concerning the European arctic and subarctic dwarf shrubby birch, a soboliferous species rarely more than 1 meter high. Drake Title: Ficus, ejusque historia naturalis & medica. 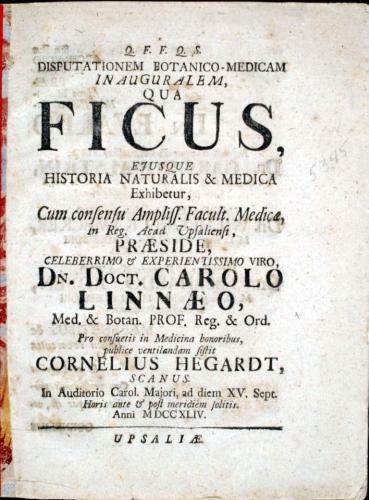 Abstract: An account of the common fig, with an emphasis on its medicinal uses. Abstract: An account of colonies of Antirrhinum linaria (Linaria vulgaris Hill), which at one time was considered to be a distinct genus (Peloria L.) and in this dissertation is recognized correctly as a teratological form which produced actinomorphic gamopetalous corollas lacking any nectariferous spur. He observed, in some instances, that these flowers and the typical zygomorphic spurred corollas occurred on the same plant, and that the teratological flowers were sterile. Abstract: An essay on corals of the Baltic Sea. 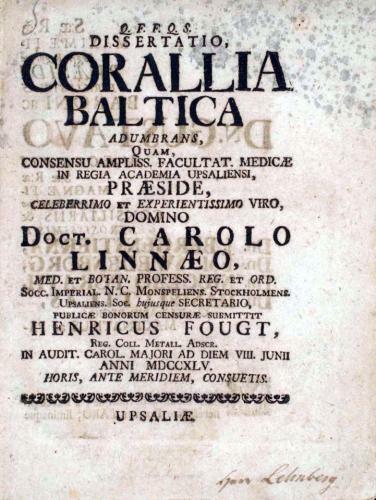 Abstract: Linnaeus' first publication to present his adopted method of zoological description. 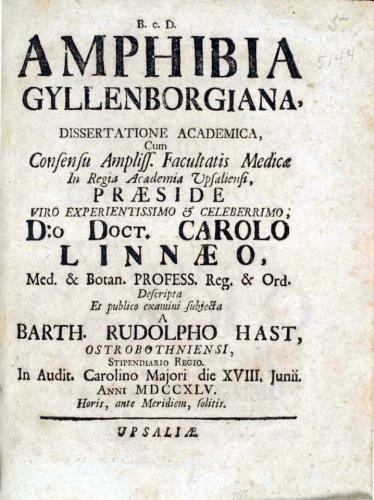 It provides an account of 24 species of amphibia in the collection of Count Carl Gyllenborg (1679-1746), which he presented to the University of Uppsala. Drake Title: Plantae Martino-Burserianae explicatae. Note: P. 19 unnumbered in two of three copies. 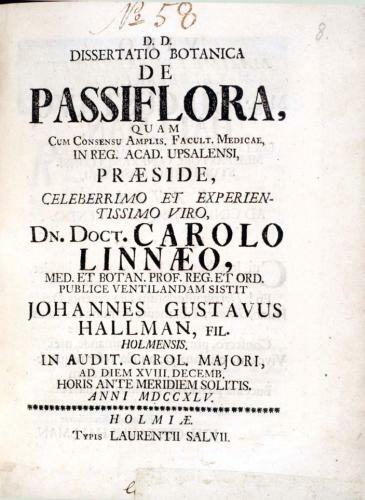 Abstract: An account of what Linnaeus held to be the 240 rarest species of plants in the herbarium of Joachim Burser (1583-1639), a collection of 25 volumes, presented to the University of Uppsala by M. Coijet. Note: P. 42 unnumbered in one of two copies. 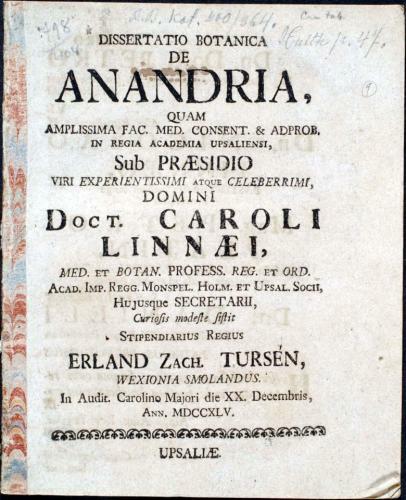 Abstract: An essay on the history of European botanic gardens, and of the botanic garden at Uppsala, which had been founded by Olof Rudbeck the elder. 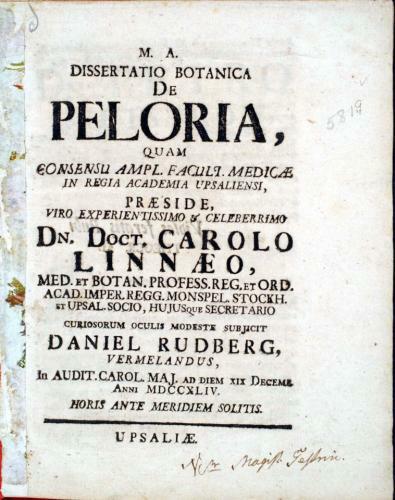 By the time Linnaeus assumed responsibility for the garden, it had fallen into disrepair. Restoration was made possible in a few years due to the funds at his disposal, generous gifts of plants and the hiring of additional gardeners. 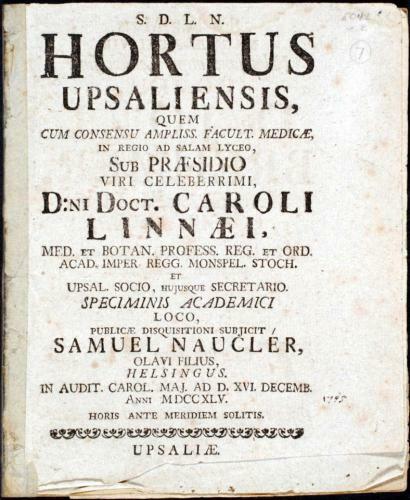 Included in the dissertation are biographical accounts of Olof Rudbeck (1630-1702) and of his son, Olof Rudbeck (1660-1740). 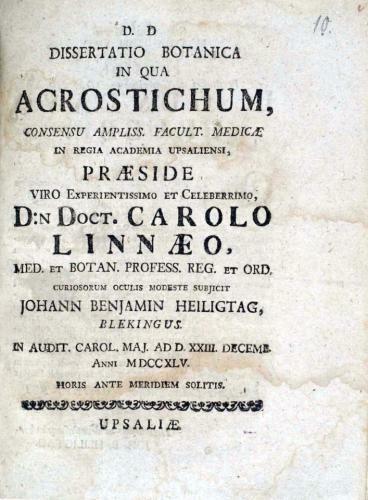 Reference is made to Linnaeus' centigrade thermometer. Abstract: Enumerates 22 species of Passiflora, adding a list of those which appeared to be of dubious specific rank. 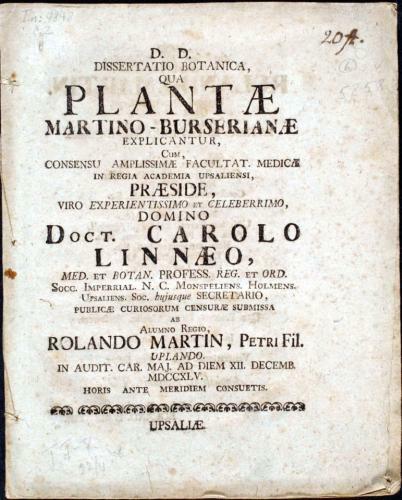 Includes an historical review of the introduction of the plants from Latin America. The morphological features of the flower and their association with the passion and death of Christ are reviewed. Abstract: This Siberian plant (Tussilago anandria L.) was earlier named Anandria by Johann Georg Siegesbeck (1686-1755), a St. Petersburg botanist, who believed it to provide indisputable proof that Linnaeus' doctrine of the sexes of plants was false. Note: Soulsby notes a plate cited in the text, but he hadn't seen one, our copy has no plate. Abstract: A study of the then-known species of the fern genus Acrostichum. 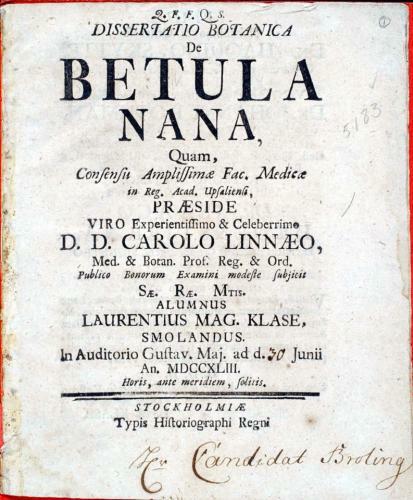 No Linnaean trivial names or Latin binomials are given.